I recently attended the Jubilee celebration of Benedictines celebrating their 60th anniversary of monastic profession. There was a palpable peacefulness present as I interacted with them. Later I read this commentary by Richard Rohr that clearly expressed what I sensed in their presence. “In the second half of life, we do not have strong and final opinions about everything, every event, or most people, as much as we allow things and people to delight us, sadden us, and truly influence us. We no longer need to change or adjust other people to be happy ourselves. Ironically we are more than ever before in a position to change people—but we do not need to—and that makes all the difference. We have moved from doing to being to an utterly new kind of doing that flows almost organically, quietly, and by osmosis. Our actions are less compulsive. We do what we are called to do, and then try to let go of the consequences. We usually cannot do that very well when we are young. Now we aid and influence people simply by being who we are. Human integrity probably influences and moves people from potency to action more than anything else. An elder’s deep and studied passion carries so much more power than superficial and loudly stated principles. Our peace is needed more than our anger.” Adapted from Falling Upward: A Spirituality for the Two Halves of Life. 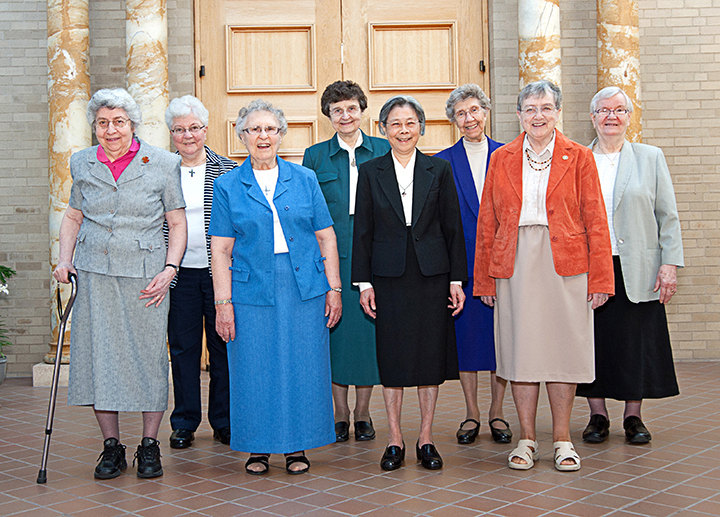 Thank you, Jubilarians, for adding your peacefulness to the balance of peace we have in this world of ours. Note: A Youtube video is available of Fr Richard Rohr presenting the content of Falling Upward.